Geneva, 18 June 2015 - The International Consortium on Combating Wildlife Crime (ICCWC) welcomed today the results achieved during Operation COBRA III, an international law enforcement operation conducted in May 2015 with the aim of combating wildlife crime and bringing the criminals involved to justice. 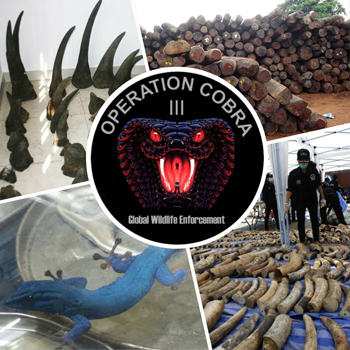 Operation COBRA III resulted in 139 arrests and more than 247 seizures, which included elephant ivory, medicinal plants, rhino horns, pangolins, rosewood, tortoises and many other plant and animal specimens. Key successes during the operation included the arrest of a Chinese national believed to have been coordinating rhino horn smuggling from Namibia, the arrest of a notorious elephant poacher in India and the seizure of 340 elephant tusks and 65 rhino horns in Mozambique. Over 50,000 illegal wildlife items were seized in the United Kingdom, as well as an additional 10,000 in Austria and 5,000 in Germany, which included large volumes of illegal supplement capsules containing wildlife products. Other countries where large numbers of illegal items were seized include China, Singapore and South Africa. In total, 37 countries reported seizures and/or arrests during the operation. Mr. Yury Fedotov, Executive Director of the United Nations Office on Drugs and Crime (UNODC), highlighted that "the success of Operation COBRA III sheds light on the widespread and intricate network of criminals who are profiting from wildlife trafficking worldwide. While I congratulate the participating countries on these seizures, I also hope that equal emphasis is placed on the prosecutions and intelligence-led investigations which have to follow. It is key to keep in mind that it takes a network to defeat a network." Multilateral cooperation and collective efforts stood at the centre of the operation organized by regional enforcement networks and intergovernmental organizations under the chairmanship of the Association of South East Asian Nations Wildlife Enforcement Network (ASEAN-WEN) Law Enforcement Extension Office. Officers from customs, police, forestry, wildlife and other law enforcement agencies from 62 countries in Africa, America, Asia and Europe worked together closely to combat the illegal wildlife trade. ICCWC made a significant contribution to Operation COBRA III by providing financial, operational and technical support. Generous funding to ICCWC by the European Commission enabled the consortium to fund the establishment and operation of an International Coordination Team in Bangkok, staffed by representatives from participating countries, wildlife enforcement networks and intergovernmental organizations. This significantly promoted cooperation and information sharing and provided an opportunity for enforcement officers to work side by side with their counterparts from other countries on identified cases. CENcomm, the World Customs Organization’s (WCO) secure and encrypted communication tool enabled investigators to exchange real time intelligence and information, and to target and track suspicious cargoes, poachers and traffickers of endangered species. “Wildlife poaching and smuggling continue to threaten many endangered species with extinction. Cooperative enforcement operations such as this one are crucial to combat these nefarious activities and to raise awareness of the problem’s scale. I commend the customs authorities and other agencies that are making a difference on the ground in the struggle against wildlife crime,” said WCO’s Secretary General, Mr. Kunio Mikuriya. INTERPOL on behalf of ICCWC led the support provided by the consortium during Operation COBRA III. “International collaboration to address wildlife crime is the main priority of the International Consortium on Combating Wildlife Crime. It is through initiatives like Operation COBRA III that ICCWC can provide support and guidance to countries to help them prioritize transnational investigations of wildlife crime, enhance the impact of their enforcement activities, and ensure the appropriate investigative follow-up occurs,” said Mr. Cees Van Duijn, Coordinator of biodiversity projects with INTERPOL’s Environmental Security unit. Officers from INTERPOL, the WCO Asia/Pacific Regional Intelligence Liaison Office (RILO) and the WCO East and South Africa RILO worked with national law enforcement agencies and wildlife enforcement networks in the Bangkok International Coordination Team. The CITES Secretariat supported the operation from its Geneva office and analysts from UNODC were deployed to assist with the collection and analysis of data. Mr. Vatanarak Suranartyuth, Director of ASEAN-WEN Law Enforcement Extension Office noted that “the success of Operation COBRA III resulted from the commitment of all partners to exchange intelligence and tackle the illegal wildlife trade across source, transit, and consumer countries.” Mr. Suranartyuth also stressed that “we are really focusing on taking action against wildlife crime syndicates by cooperating and coordinating closely through the International Coordination Team and will follow up on our investigations”. Further arrests and prosecutions could be expected, as follow up investigations resulting from the operation continue. Please note that the number of seizures and arrests indicated above only includes those made during the operational period. Pre-operational data has not been included. For more information, contact Liu Yuan at +41 22 917 8130 or [email protected]. With 181 State Parties, CITES remains one of the world's most powerful tools for biodiversity conservation through the regulation of trade in wild fauna and flora. Thousands of species are internationally traded and used by people in their daily lives for food, housing, health care, ecotourism, cosmetics or fashion.